were sinking into the depths of the Great Depression. 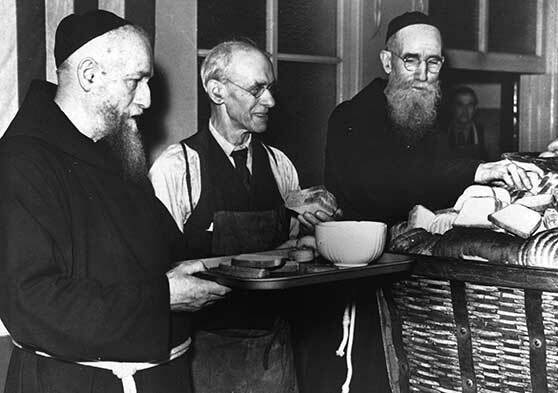 to start the Capuchin Soup Kitchen. coming to the door of St. Bonaventure Monastery seeking something to eat. a hearty soup with bread. The friars relied largely on donations to make the operation work. there was little bread and hundreds of hungry people stood in line! The friars had neither the time nor the money to buy enough. One of them ran to the Monastery to tell Fr. Solanus about the problem. and assured the friar that God would provide. A few minutes later, a truck filled with bread arrived! Everyone had enough to eat. even in the face of apparent scarcity. a humble but substantial offering. but the offering was of “the first fruits” of the harvest. instructs his servant to share the loaves with the people. how can he set such a seemingly meager amount before so many people? and everyone has more than enough to eat. though we might call it a story of last resorts rather than first fruits. Jesus tries to get away to a mountain with his disciples. hungry to experience the grace and power of Jesus’ works and words. and after some time he sees that they have grown physically hungry, too. He commands his disciples to give them something to eat. the disciples are astounded and frightened by this request. to buy the amount of food needed to feed the crowds. and trusts in divine providence to do the rest. happened near the time of Passover. That is a significant detail. as his Body and Blood. an extended reflection that will encompass the rest of Chapter 6.
to eat his Body and drink his Blood. and we trust in God’s grace and goodness to supply what we need. or Bl. Solanus about that bread truck.